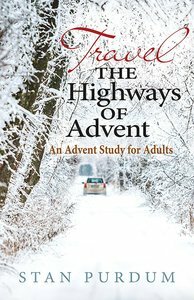 This thematic Bible study is designed to be used by individuals and small groups during the Advent 2014 season. The book, written by Stan Purdum, is based on the particular pathways to Jesus during Advent. In addition to the main content, each chapter offers questions for reflection and discussion, a brief prayer, and a focus for the week. The focus emerges from the chapter content and encourages the readers to engage in spiritual practice or do something specific that will help them grow in faith. On the whole, this thematic seasonal Bible study series is designed for transformation and for applying the study of the Bible to everyday, practical life experience. It is intended to nurture and encourage faith development and spiritual growth. About "Travel the Highways of Advent"
Stan Purdum is the pastor of Centenary United Methodist Church in Waynesburg, Ohio. He has served as the editor for the preaching journals Emphasis and Homiletics, and has written extensively for both the religious and secular press. Purdum is the author of New Mercies I See (CSS) and He Walked in Galilee (Abingdon Press), as well as two accounts of long-distance bicycle journeys, Roll Around Heaven All Day and Playing in Traffic. Stan is a graduate of Youngstown State University, Methodist Theological School in Ohio, and Drew University Theological School.